Now here is something different. Instead of usual mix show I post this time a little compilation tape called "Funana Absurdos - experimental sounds from Cabo Verde". As some regular followers (are there any?) of my other blog might remember, I spent a holiday in Cabo Verde recently. 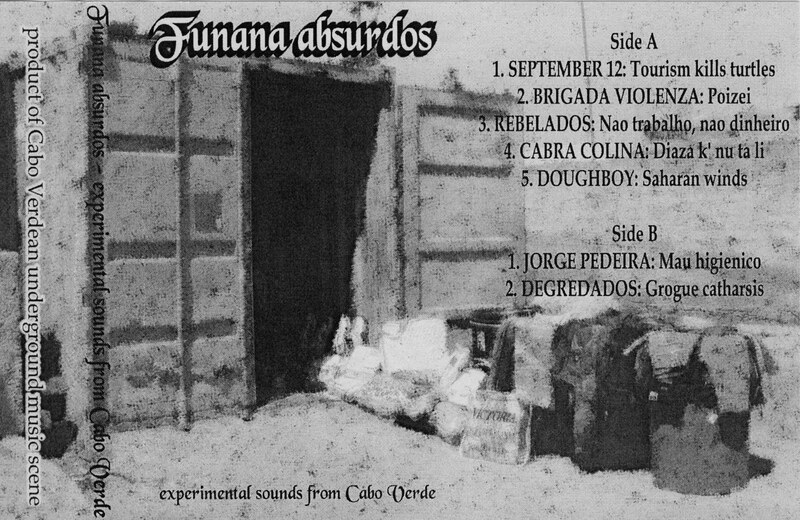 This tape is a compilation of totally unknown (at least to me) underground artists of Cabo Verdean origin... I think, since there is absolutely no information whatsoever included. Only a 60 minute tape with seven tracks which range from noise to ambient, cut-up loops of some local hit music (my wild guess), field recording madness and something which I would call 'drunken ambient' (listen to the last track and you know what I mean). Tape was ripped as two mp3-files (side A & side B). There´s music approx. 40 mins but it seems that tracks have been dubbed on radio interference noise recordings which you can hear in the middle of songs and in the end of both sides. Strange. Place it right next to your "Extreme music from Africa" -compilation cd. Hi, I came across this post and am working my way through Side B as I type right now. Do you know the story behind these recordings? Are these artists actually from Cape Verde? How did you get this tape? I am thinking of traveling to Cape Verde soon and would love to get in touch with the artists on this record. I have my doubts. Got it from some dude with a bunch of weird noise tapes. You probably will have some hard time trying to track down these artists or this tape. While in CV, if you ask for Cabo Verde music they are eager to sell you pretty much anything but the item you are actually trying to find. It is truly annoying. There is annual jazz festival in Praia so that would be the best place to check out something special... if there is any.